Follow the steps below to confirm the results of the DUT’s phase noise measurement by using the E5052B’s phase noise measurement window. To improve readability and reduce search time, few sections of this topic are combined with similar sections from other measurements in Measurement > Common Settings. Links to these new sections are provided in this topic. Format options are not available for Phase Noise measurement. When the downconverter is turned on, the RF input is set to Downconverter, and the external mixer is set to Not Used, the function to search for the carrier signal in the specified carrier frequency band and reflect the result to the nominal frequency is available. Press Carrier Search to execute the carrier signal search. The detected signal frequency is reflected on the nominal frequency. Press Marker to display marker 1 on the screen. Move marker 1 to the point you want to confirm and read the measurement value displayed in the upper part of the graph. To confirm multiple values, press Marker > Marker x (x=1 to 10), which allows you to display up to marker 10. In this measurement, you cannot specify the sweep time. It will be determined automatically based on the selection of the offset frequency sweep range and the carrier frequency band. Specify the noise integration range by using the band marker. For further detail, refer to Searching in Specified Range. You do not have to use the band marker to integrate the entire range. Press Marker Fctn > Analysis Type. Press Integral. In the upper right part of the screen, you will see the Integral Phase Noise value [dBc], the RMS Noise value [rad, deg], the RMS Jitter value [sec] and Residual FM value [Hzrms]. Calculate Integral Phase Noise, Jitter and Residual FM, using the specified data by Analysis range. Integral Phase Noise returns the value of SSB Integral result. 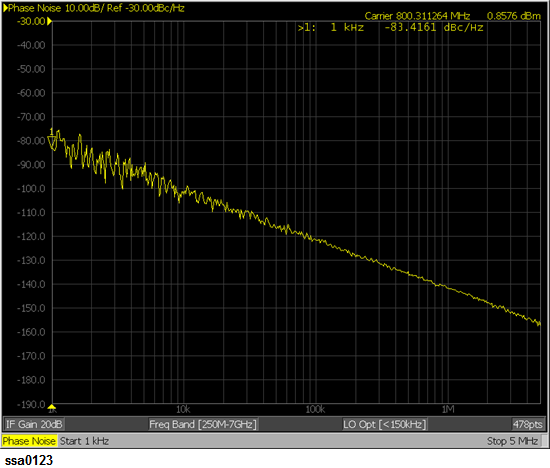 RMS Noise, Jitter and Residual FM returns the value after applying the DSB conversion. When Power is selected in the Spurious measurement, it is calculated with adding the power of Spurious after integrating except Spurious. It is available to calculate the Allan Variance and Jitter using the measured average time and the measured cut-off frequency. The value obtained with E5052B as Sigma is standard deviation, and the Allan Variance as the general definition is the value that is squared this Sigma.